But there are some reason to exclude from Modi's Ayushman Bharat Health Insurance. 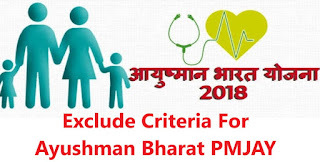 All those households who fulfill any of the following 14 exclusion criteria as per SECC are automatically excluded and not eligible for Ayushman Bharat PMJAY Heath Insurance. Motorized wheeler (2/3/4 wheeler) /fishing boat. Mechanized 3-4 wheeler agricultural equipment.